I am all about easy recipes and this quinoa with roasted vegetables is no exception. 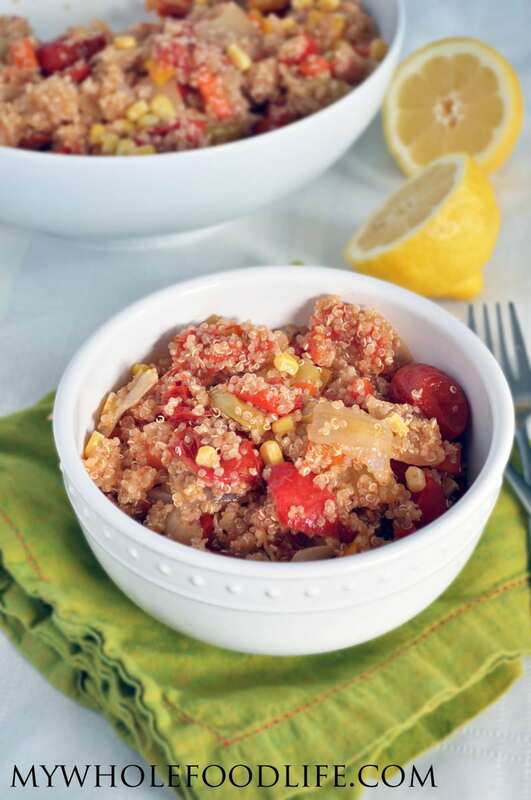 Not only is this quinoa with roasted vegetables easy, but it calls for ingredients you may already have in your kitchen! It’s going to be one of my go to recipes for sure. Great in summer or winter. Eat it hot or cold. If you like quinoa recipes, you may also like this and this. I was really amazed that this dish had so much flavor with such simple ingredients. Another thing you can probably do with this is to cook the quinoa in vegetable broth instead of water. It should add an even deeper level of flavor. This dish is vegan and gluten free. I hope you enjoy it. Any easy and healthy meal option! Add the quinoa and water to a small saucepan . Bring to a boil, then turn down, cover and simmer until all the liquid has been absorbed. Mine took about 7-10 minutes. Spread all the chopped veggies, except the corn, onto a lined baking sheet . Brush them with the oil and sprinkle with salt and pepper. Roast for 1 hour. Stop halfway to flip the veggies over. When there is only about 5 minutes left, add in the corn. Once the vegetables are done, add them to the quinoa and mix well. This is the time to add the lemon juice as well. Take a taste and add more salt, pepper or garlic if needed. This dish should last a week in the fridge. Enjoy! Do you think this will freeze well? Can't wait to try it with the vegetable broth. I'm guessing it will freeze just fine. Wondering if you can taste the coconut in this dish? Or how do you think it would be using avocado oil instead? I couldn't taste it. However, you can use another oil if you like. I LOVE this!! I ate my weight in this.